Most of the time when I highlight an interesting trade I’ve seen in the market, it’s something I’m looking at in terms of profit-making potential. That may seem obvious, but don’t forget, options make wonderful risk management tools as well. In fact, they’re probably the most efficient tools for portfolio risk protection out there. There are times when I see an interesting or unique hedge in the options market that I think is worth sharing. It doesn’t happen all that often, because let’s face it, hedges are boring. You usually hope your hedge expires worthless because that means the asset you’re protecting is holding its own. But, options are such great tools for risk management, there are times when you’ll see very creative uses of trades for hedging. And while risk management may not be all that exciting a topic (relative to making big profits), there is certainly something to be said about being able to sleep at night. Trust me, as a former floor trader and market maker, being able to sleep at night is something no investor or trader should take for granted. One method of risk management which has gained popularity since the 2009 financial crisis is called tail-risk hedging. Another term for a tail-risk event is a black swan event. In other words, it’s something that’s supposed to be very rare. The 2009 financial crisis and the crash of 1987 are both considered black swan events. Protecting against black swan events is difficult, because by their nature, they don’t happen that often and you don’t expect them to ever happen. Investors want to protect against them but don’t want to spend too much on something that may take years to occur. That’s why the trade I saw recently works very well as a tail-risk hedge. 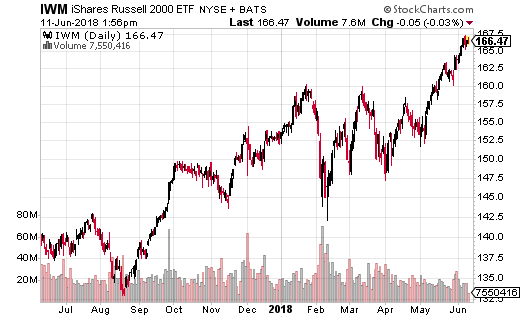 It was executed in iShares Russell 2000 ETF(NYSE: IWM), the leading ETF for small cap stocks. As you can see below, IWM has had a heck of a run this year, especially since the beginning of May. However, small caps tend to be the first stocks to be dumped out of a portfolio when economic or market correction concerns arise. That’s why IWM would likely get hit hard if a black swan event occurs in the coming weeks. Of course, no one expects a major market correction to happen prior to July 20th (options expiration), so that’s why this IWM options trader found a trade which was really cheap to put on. Specifically, he or she bought 5,000 151-153 July 20th put spreads (buying the 153 put, selling the 151 put) for $0.10 with the stock at $166. It’s highly unlikely that the market will drop 10% in the next six weeks or so, which is why this is a tail-risk hedge… but also why it only costs $0.10 or $50,000 for 5,000 spreads. $50.000 is the max risk, which isn’t very much for so many contracts. On the other hand, max gain is $1.90 or $950,000 should IWM crash. $50,000 risked to make $950,000? That’s what I consider to be a very affordable and efficient tail-risk hedge. If you have exposure to small caps in your portfolio, or just want to protect against a major selloff in small cap stocks, this is a very reasonable trade to make. Is Trump “Flipping” the U.S. Economy?